Director: Wolfgang Petersen. With George Clooney, Mark Wahlberg, John C. Reilly, Diane Lane, Mary Elizabeth Mastrantonio, William Fichtner, John Hawkes, Allen Payne, Cherry Jones, Karen Allen, Bob Gunton, Dash Mihok, Janet Wright, Rusty Schwimmer. Screenplay: William D. Wittliff (based on the book by Sebastian Junger). Without question director Petersen's best film since 1993's In the Line of Fire, The Perfect Storm is admittedly far from perfect, a verdict which will be all the more apparent, I'm sure, when it is transferred to video and DVD. After all, what seem like the primary virtues of the filmglorious, sometimes show-offy wide shots of the calm open sea, care of ace cinematographer John Seale (The English Patient), and dazzling special effects that convey the horrors of the ocean when agitatedwill both be miniaturized and safely contained by a small screen. Clunky dialogue and a maudlin, intrusive score by James Horner, who wrote better music before being Oscared for a different boat movie, will be harder not to notice. Hopefully, though, repeated viewings of the film, even after its visual grandeur has been reduced, will expose what truly distinguishes The Perfect Storm from its summertime competitors at the cineplex. On this all too rare occasion, the thrills of a blockbuster action film emerge from the lives and emotions of recognizable human beings. There is real weight and affect attached to what these men are trying to accomplish and, therefore, attached as well to the desperate circumstances in which they find themselves. In a movie like Armageddon, the people are important only insofar as they show up to deflect an asteroid; in The Perfect Storm, the hurricanes and other cataclysms are important because they threaten people we care about, for whose survival we are fiercely rooting. 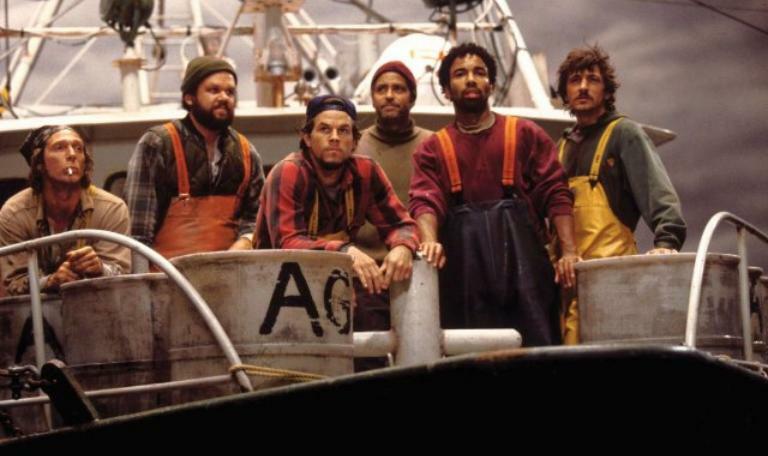 George Clooney, who has recently made the best project choices of any major star, headlines the cast as Billy Tyne, the captain of a swordfishing boat called the Andrea Gail. Tyne insists that his crew venture into uncertain weather in the always-unpredictable North Atlantic to make one last haul before the end of the season. Whether he makes this decision out of financial need, arrogance, perverse idiocy, or wounded pridehis colleagues in Gloucester, Massachusetts, including Captain Linda Greenlaw (Mary Elizabeth Mastrantonio), are all raking in more fish and more money than he iscannot be clearly determined. Fortunately, our uncertainty about this character, whom both Clooney and William D. Wittliff's screenplay keep refreshingly aloof, means that we can't ever predict how he will act when conditions turn worrisome, and ultimately catastrophic, during the doomed voyage out. None of the other characters have quite the same claim on our interest, perhaps because they all fit more snugly into generic conventions. Mark Wahlberg's Bobby Shatford is the hunky romantic who reconciles himself to the unexpected trip so he can better support his wife Christine (A Walk on the Moon's Diane Lane). John C. Reilly's Dale Murphy is a middle-aged man still saddened by his divorce and his separation from his children. William Fichtner's "Sully" Sullivan fits the actor's tendency to play either sweet-willed innocents or sour-tempered hotheads. (Here, he's a hothead.) John Hawkes' "Bugsy" Moran is an aging sad-sack who boards the Andrea Gail just as a flirtation with local woman Irene (Rusty Schwimmer) is starting to blossom. That Allen Payne's Alfred Pierre, the only non-white character, is also the most briefly and unimaginatively developedhe likes to go to bed with his girlfriend and, once there, shake the walls of the innis another depressing confirmation that Hollywood continues to short-change black characters in every possible genre. What happens once the Andrea Gail runs into the unprecedented collision of three separate storm systems is familiar to those who read Sebastian Junger's superlative, bestselling book, and deserves to be kept mysterious to those who haven't read it. (Whether or not you see or enjoy the movie, the book demands and deserves attention.) The escalating tension as the weather worsens, and the crew's courageous attempts to combat deafening wind and mile-high water, are nail-bitingly detailed. In fact, Petersen proves to be the rare action director who not only refuses to sell out completely to the demand for special effects, but who refuses perhaps too strongly. If anything, he risks weakening his film by cutting away too often from the maritime perils to the anxious crowds onshore, and even to a subplot about a luxury sailboat that gets caught in the same storm. The passengers on that boat, played by the estimable Cherry Jones, Karen Allen, and Bob Gunton, are well-played, and the scenes well-staged. We just have too little idea of whom we are watching, and of where they are, and of how to balance the stakes of what feels in this context like a side-story against the tragic heft that The Perfect Storm has invested in the plight of the Andrea Gail. Still, the insistence by the director, the screenplay, and the editing that we focus on more than titanic waves and heaving vessels offers further proof that The Perfect Storm is not, at heart, an action movie. Warner Brothers has shown considerable commercial savvy in transforming Junger's book into a blockbuster, and it works very well under those terms: you'll get the desired bang for your bucks, maybe even more than you expect. Still, the material's central concern is to show us a particular way of life, including the remarkable risks these fishermen run to earn their keep, and to feed a nation of strangers. It is a telling fact that Wittliff's best previous screenplay, for the 1984 Jessica Lange drama Country, detailed the plight of midwestern farmers who fought for their land against Reagan-era takeovers. Work and lifestyle are equally important, and equally intertwined, in The Perfect Storm, whose scenes of labor aboard the boat, even before disaster strikes, are both sobering and thrilling in about equal degrees.